After a major role in the hit movie: Finding Nemo, Dory was given the star role in her very own movie entitled Finding Dory. Introducing Dory, from the hit movie: Finding Nemo. She now has her own hit movie called Finding Dory. Nemo’s best friend is always optimistic, but has trouble remembering things. 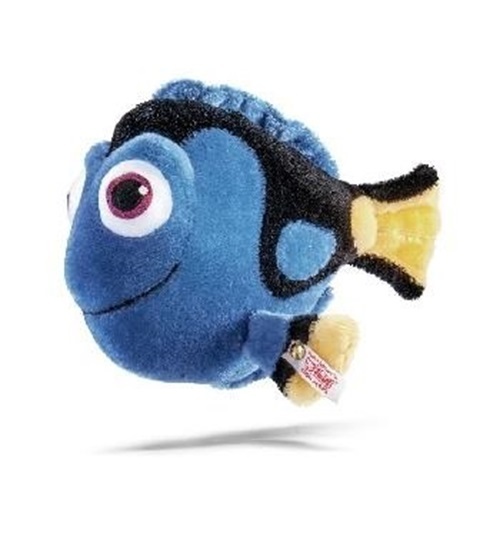 Despite her fault y memory, Dory is a loyal, kind, and friendly fish. She is 8-inches long and is sewn from blue, black, and yellow mohair with airbrushed details. Her twinkling safety eyes have been beautifully embroidered with purple lined around the black pupils. Her fin is adorned with a white, gold plated “Button in Ear” Steiff tag. She is a limited edition of 2000 pieces and is part of Steiff’s Worldwide Limited Edition Collection.